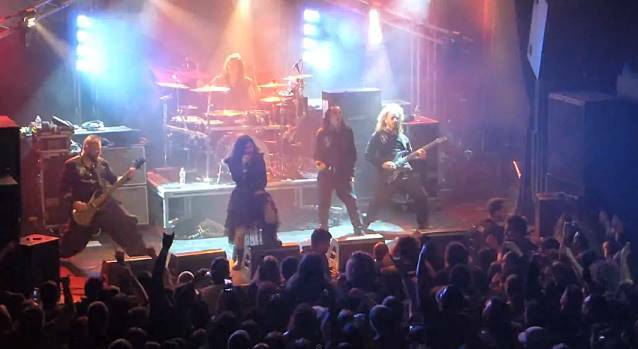 Fan-filmed video footage of LACUNA COIL's February 24 performance at Irving Plaza in New York City can be seen below. LACUNA COIL's new studio album, "Broken Crown Halo", will be released in North America on April 1 (one day earlier internationally) via Century Media Records. The CD was recorded Italy by producer Jay Baumgardner (P.O.D., SEVENDUST, EVANESCENCE, PAPA ROACH) and engineer Kyle Hoffmann (P.O.D., BUSH, ZEBRAHEAD). The effort was mastered by Howie Weinberg, whose credits include RAMMSTEIN, SOUNDGARDEN, NIRVANA, DEFTONES and SHERYL CROW. LACUNA COIL is touring as a quintet following the departures of guitarist Cris "Pizza" Migliore and drummer Cristiano "Criz" Mozzati. Marco "Maus" Biazzi is handling all guitar duties on the trek while drummer Ryan Blake Folden is once again sitting behind the kit. The band states: "Fans will already be familiar with Ryan, as he performed live with LACUNA COIL on the majority of the 2012 and 2013 'Dark Legacy' and 'Dark Adrenaline' tours." Regarding the departures of Migliore and Mozzati, LACUNA COIL singer Cristina Scabbia told U.K.'s Metal Hammer: "It's something we announced [on February 14] but knew for a few weeks, and honestly, I feel good, because we couldn't have a better — I don't even wasn't to use the word ‘split'; that sounds like, 'Oh, we had a big fight and we don't want to see each other anymore,' she said. She continued: "It's too early to think about replacements, and we don't even know if we want that. We might work with session musicians for a while, because even if we are serene and happy, it's hard for us, because we lost two brothers, so we don't want anyone to come into the family just like that. It would be wise, I think, just to go on with us four and then move on with friends like Ryan, who is a great drummer and very easy to get along with. And that's an important factor, because if you're going to share a tour bus with people, you have to be able to get along with them!" 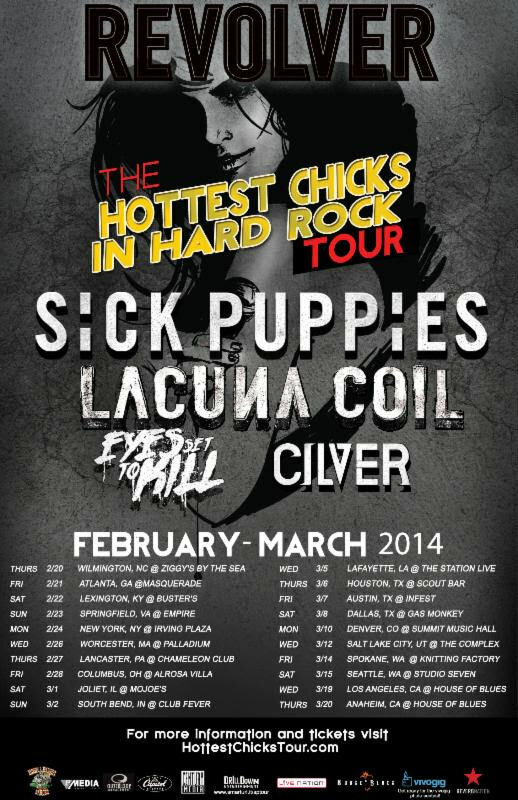 The Revolver-magazine-presented "The Hottest Chicks In Hard Rock Tour runs through March 20 in Anaheim, California. Visit www.hottestchickstour.com for additional details and VIP packages.